Secure your 1/10 oz 1991 gold panda online at the lowest price today. The extremely popular gold panda series is maintained with this 1991 rendition in 999 fine gold. The panda is displayed seated by a water stream enjoying a bamboo twig on its reverse. The obverse illustrates the Hall of prayer for abundant harvests in the temple of heaven, located in Beijing. The gold panda series are always in demand. Procurez-vous la vôtre dès aujourd'hui! 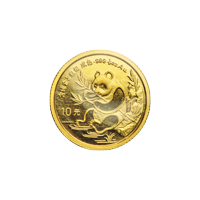 Pièce d'or Panda chinois 1991 de 1/10 once Secure your 1/10 oz 1991 gold panda online at the lowest price today. The extremely popular gold panda series is maintained with this 1991 rendition in 999 fine gold. The panda is displayed seated by a water stream enjoying a bamboo twig on its reverse. The obverse illustrates the Hall of prayer for abundant harvests in the temple of heaven, located in Beijing. The gold panda series are always in demand. Procurez-vous la vôtre dès aujourd'hui!